1 of 6 Cut kernels off ears of corn; you will have about 1 cup. Set aside. 2 of 6 Bring medium-size saucepan of water to a boil over high heat. Add green beans and cook for 4 minutes or until beans are just tender. Drain and rinse under cold water. Place in a medium-size bowl and stir together with tomatoes and basil. 3 of 6 In a large skillet, heat olive oil and butter over medium-high heat. Add scallions and cook for 1 minute. Add corn, zucchini, yellow pepper and 1/2 teaspoon of the salt; cook for 6 minutes, stirring occasionally. 4 of 6 Stir together 1/3 cup of the coconut milk and the cornstarch; set aside. 5 of 6 Nestle tilapia into pan and sprinkle with remaining 1/2 teaspoon salt and black pepper. Add remaining coconut milk and cover. 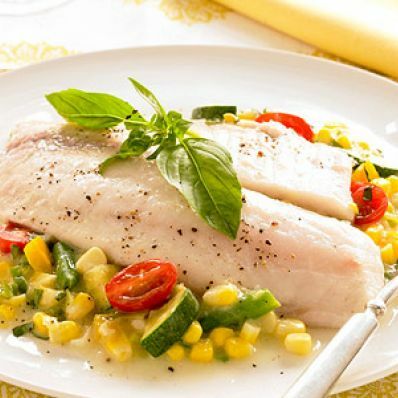 Cook for 5 minutes, or until internal temperature of tilapia registers 160 degree F on an instant-read thermometer. 6 of 6 Uncover skillet and add reserved coconut milk mixture, green beans, tomatoes and chopped basil. Cook for 2 minutes or until liquid has thickened. Serve immediately.